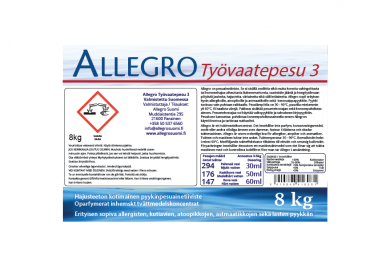 Allegro Pro Workwear 8 kg Fragrance-free laundry detergent, developed specially for washing workwear. 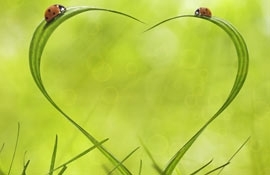 Formulated for sensitive skin. Orders made on weekdays before 12:00 (GMT+2) will ship the same day. 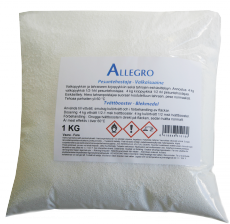 Allegro Pro Workear laundry detergent is especially suited for washing even the dirtiest workwear. Allegro washes your laundry clean and fresh, without any scents. Allegro is great for childrens laundry and cloth diapers. 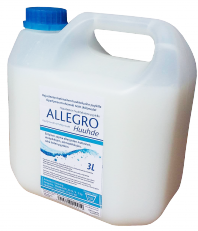 Allegro is favored by doctors and recommended by the washing machine manufacturers. 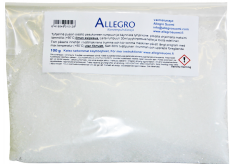 Allegro does not contain zeolite, perfumes, dyes or other discoloring agents. 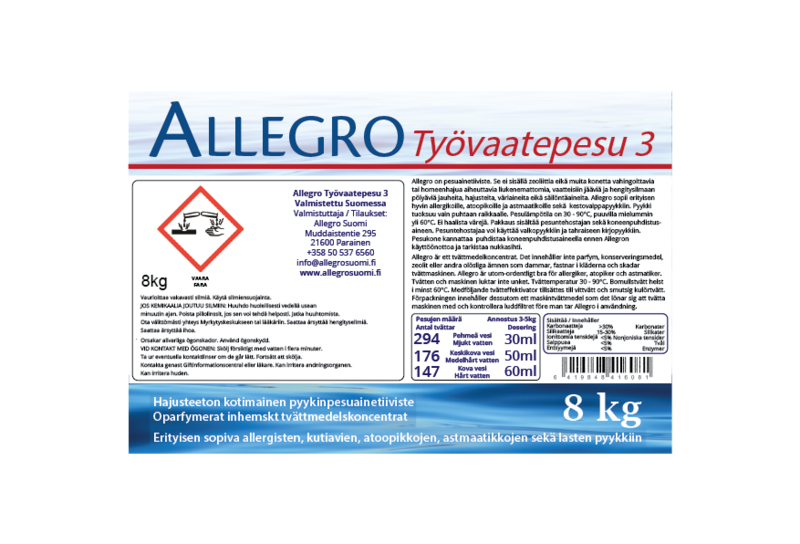 Allegro Plus is our popular product. 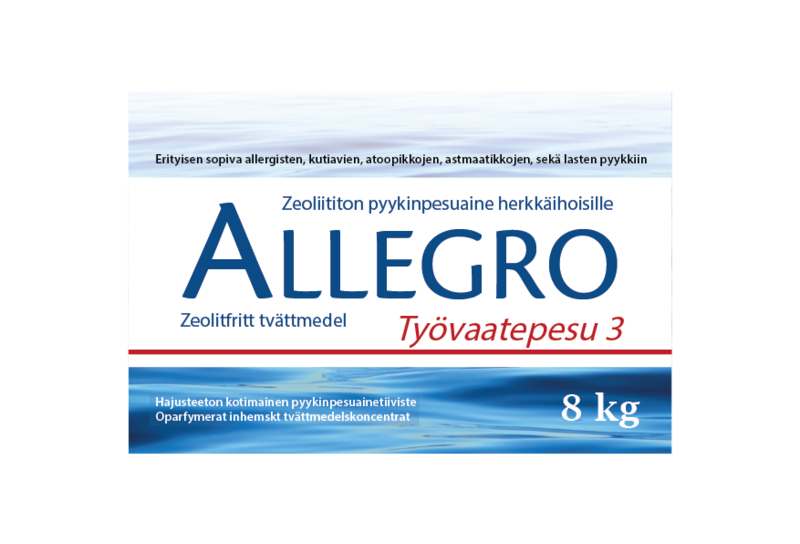 All Allegro products are produced in Parainen, Finland. The package contains also Machine Cleaner that helps you to wash your washing machine clean and fresh. Machine Cleaner removes smells and zeolite from your washing machine. 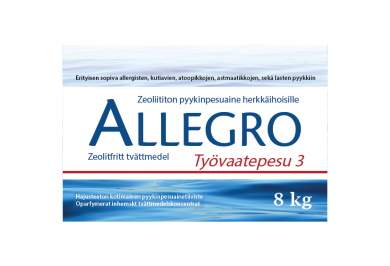 Allegro does not contain any zeolite or other substances that cause bad smell or damage the washing machine. Allegro laundry detergent does not contain zeolitefragrances, dyes or discolouring agents, preservatives or optical brighteners. MI free (methylisothiazolinone). With one package of Allegro Pro Workwear laundry detergent, you wash about 250 machine loads! Wash up to 250 loads - With large packaging your cost per washing machine load is only 18snt. 90 day satisfaction guarantee - Wash 20 washing machine loads, if you are not satisfied we will get full refund. Package contains: Machine Cleaner (100g), Washing Enhancer (250g) & washing powder (8kg). Sodium carbonate, sodium sulphate, Trisodium dicarboxymethyl alaninate, sodium silicate, sodium Tallowate, Sodium Cocoate, Laureth -3, Laureth -9, Protease, Amylase, Silica. You can try our Allegro laundry detergent for free. Wash 20 loads of laundry during 90 days and if you are not satisfied with the results, you can return the product. You don't need to return the machine cleaning agent and deodorizer - we give them to you for free. The shipping of an 8 kg package is free when you use Matkahuolto. Subscribe to our newsletter and get the latest offers and news to your email.